For the nonspecialist and philosophical adept as well: an accessible, anecdotally rich life of the “trenchant idealist” who turned philosophical idealism upside-down. Nietzsche’s life (1844–1900) offers one of the great moments of philosophy, a cry of the wounded soul: just before suffering a final descent into mental illness in 1889, he happened upon a carter beating a nag in the streets of Genoa and flung his arms around the poor beast, protecting it from further abuse. Cate (André Malraux, 1997, etc.) notes that we will probably never know what happened next, inasmuch as the first printed account of the incident appeared a couple of years after the philosopher’s death. Just so, much of Nietzsche’s life has been the subject of speculation, especially on the matter of whether Nietzsche gave ideological aid and comfort to Nazism: some scholars hold that Nietzsche’s evocation of the law-unto-himself “superman” gave Hitler and company certain ideas, whereas others believe that Nietzsche’s protofascist sister willfully altered his writings after his death, “bringing out a thick anthology of his hastily jotted but so far unpublished notes under the inflammatory title The Will to Power.” It does not help either argument, Cate notes, that Nietzsche himself was a disorderly writer easily capable of being misunderstood; but, he adds, Nietzsche had grounds for his unusual methods of composition and apothegmatic style, for he believed—correctly, as it turned out—that he was doomed to die young and did not have the time to be tidy. 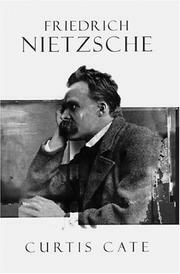 Such convictions also rationalize Nietzsche’s inability to handle money, his restlessness, and his devotion to the life-celebrating but feather-ruffling habits of the Dionysian personality type, an invention of Nietzsche’s that found its most celebrated follower in the composer Richard Wagner. Cate carefully explains the development of Nietzsche’s thought from Schopenhauerian acolyte to independent—and unique—thinker, some of whose most powerful work was penned before he was 30. A touch more readable than Ronald Hayman’s Nietzsche (1980) and more current than Walter Kaufmann’s Nietzsche: Philosopher, Psychologist, Antichrist (1974), both of which Cate complements but does not displace.